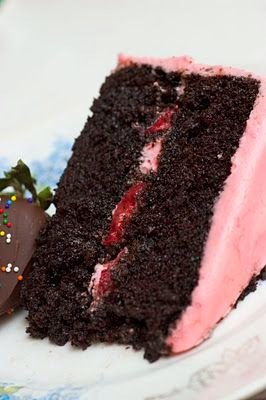 Dark Chocolate Cake with Strawberry Cream Cheese Icing | FoodGaZm.. I made this cake on 7/12/14 for my church leader's birthday. It was delicious and well received. I followed the directions exactly, using regular cocoa instead of the dark because I couldn't find any. I also sliced strawberries as the original poster did and pureed fresh strawberries in the frosting. So yummy!! Will definitely make this again.